Rinsenji Temple (林泉寺) was built in 1497 by Nagao Yoshikage, the grandfather of Uesugi Kenshin, for the cemetery of Nagao clan. Uesugi Kenshin studied literature and tactics at this temple from 7 to 14 years old. In later his life, he came back this temple and practiced ZEN. He named his name Kenshin after the 7th priest Shuken. Today, there is a museum in the temple which displays lots of Kenshin related items including his hand written letter to the priest. Admission (include museum): 500 yen for adult, 250 for kids. There is group discount from 25 people. There is parking and restroom. Rinsenji is Soto Buddhism temple founded the priest Doneieozenji in 1497. 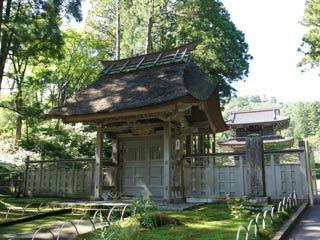 It was built by Nagao Yoshikage for his father and cemetery of Nagao clan. 40 years later, Uesugi Kenshin the grandchild of Yoshikage stayed this temple and studied literature and tactics under the 6th priest Koiku. In 1570, Kenshin came back Rinsenji and practiced Zen under the 7th priest Shuken. Kenshin found his enlightenment of his life and changed his name from Terutora to Kenshin after the priest. After Kagekatsu moved Aizu, Rinzenji was also the official cemetery for Hori clan, Matsudaira clan and Sakagibara clan. Also, Hidetada, the second Tokugawa Shogun, gave a special treat to allow Rinsenji having post of "No hours, no ride" which was special honor to have it in that time. ... was removed from the Kasugayama Castle by Uesugi Kenshin. This gate is only remaining building since 16th century. ... was reconstructed in 1925. The Nio Statue was made Takikawa Bido. The name plates which place front and back sides of the gate, " 春日山, Kasugazan" and "第一義, Daiichigi," were written by Uesugi Kenshin. Kenshin was truly respected the priest Shuken. He wrote many letters, which are displayed at the museum. Also the original name plates made by Kenshi are also displayed at museum. ... was built in 1997 for the 500 year's anniversary. It places the sculpture of Buddha, Bosatsu, Uesug Kenshin and other priests. The pained image of Kenshin in this museum is the only remaining painting of Uesugi Kenshin which painted while Kenshin was alive. Also, it has his hand written letter to the priest, name plates made from Kenshin, Kenshin's flag, and armors. Most of Kenshin's real trace are displayed in this museum. In early summer, Iris blooms in the garden.